Finally, after an extremely hot week, there is a cool breeze. Actually, it's not really a breeze, its much more forceful than that, nevertheless is is refreshing... finally! It's been a long week of relentless sun which was finally broken last night by this wind. As a consequence I woke this morning at about 2am and sat bolt upright seemly smelling bushfire smoke thru my sleep. I immediately checked the Facebook of the Rural Fire Service who handily posted that smoke from the Cooma fire was all over our valleys but there was nothing to worry about. Phew, somewhat relieved but now wide awake I lay on top of the bed, for the first time in days with a sheet and a blanket and watched with awe and trepidation the night sky light up with dry lightening strikes - just the sort that start fires around here. There have been so many reasons why I haven't blogged but the heat has been the biggest one. That combined with the fact that my very old lap top even on a cold day emits a tremendous amount of heat has made blogging not just unattractive but downright foolish and possibly life threatening, or at least leg burning. It's also hard to get inspired about blogging when after three massive heat waves your produce looks like this! Rocket - sun burnt leaves. Pear shaped tomatoes - yep, they are pear-shaped with sun scald! Speckled Roman tomato - terrible blossom end rot. For some reason this variety is particularly sensitive to this affliction caused in part by irregular watering. 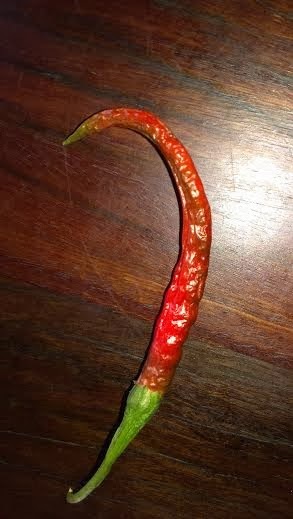 Chilli - semi dried on the bush shortly after turning red. Purple Cherokee tomato - just shrivelled! 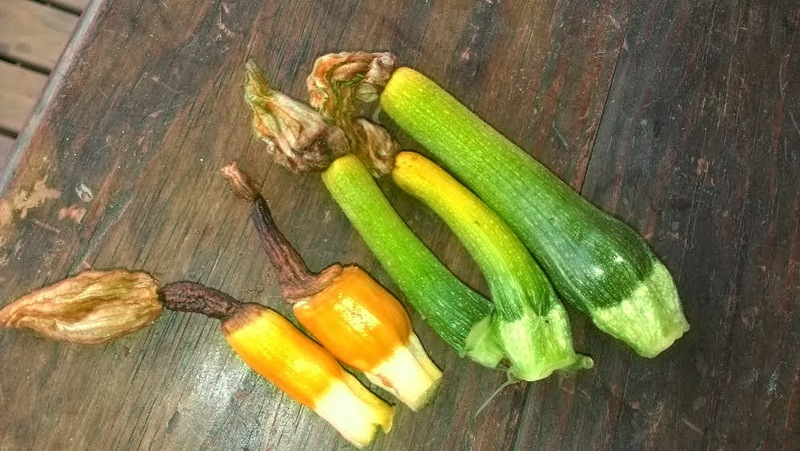 Zucchini - failure to fertilise - I find that this happens when it's too hot. Perhaps all the bees have expired? 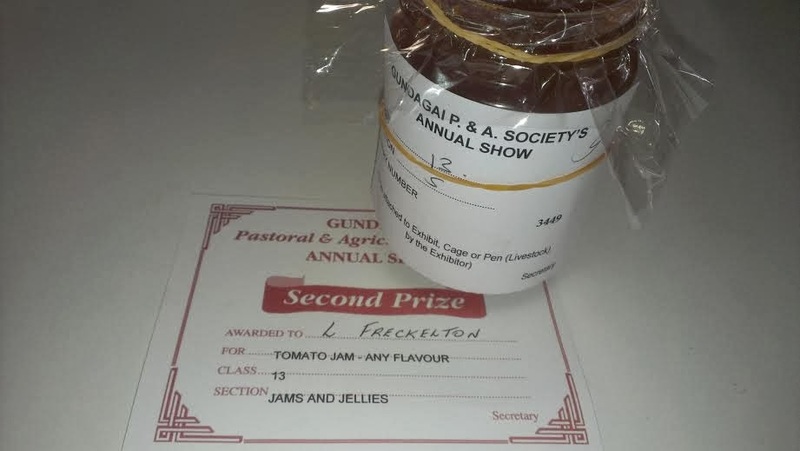 I can see now that I will not be able to manage an entry in the Gundagai Show in the category of three zucchinis under 18cms. You will notice there are no beans in the shot - that's because they have failed completely in the heat. I have been successful with a few things. Isn't it amazing that something so watery and fleshy as a cucumber produces so well in the heat? And I have been able to pick the off zucchini, yellow pepper and eggplant. 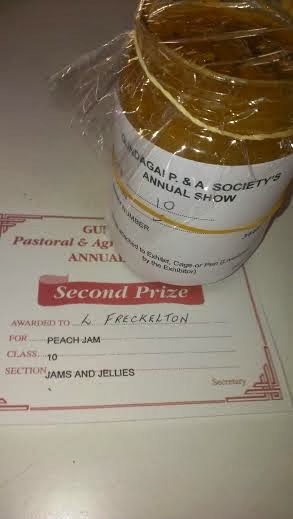 There have also been hauls of tomatoes and peaches, peaches, peaches - that is the ones that the wallaby doesn't eat. There have been upsides to the heat. It has inspired me to build a garden more appropriate to the climate - a desert garden. It's not finished yet, I need to collect some rocks from the mini quarry on our property but it's been too hot to lug large pieces of rocks around! Oh well, some things have been enjoying the heat! Here is my garden companion - gargoyle perhaps? 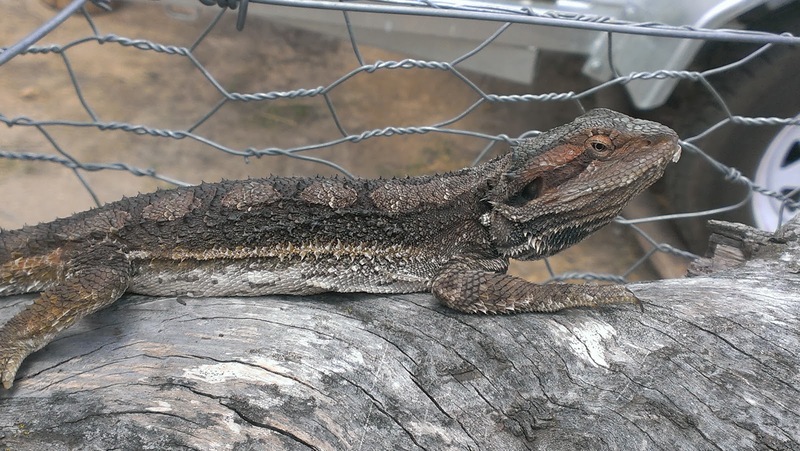 This lizard lives in Fortress Wallaby. He looks very wise doesn't he? As if this lizard knows not to try gardening in such a horrid summer climate!